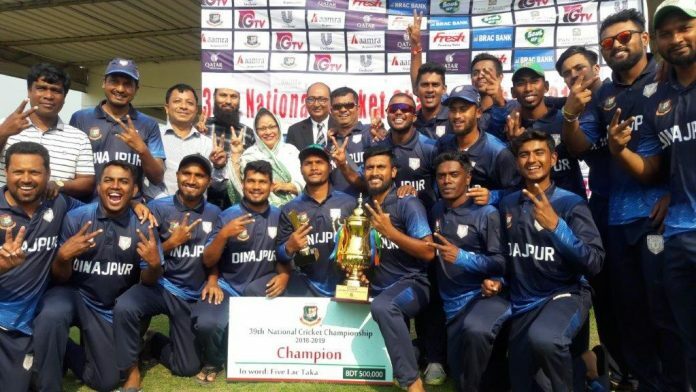 Dinajpur District won their second National Cricket Championship (NCC) title after defeating Mymensingh District by four wickets in the final match of 39th edition of the tournament in Cox’s Bazar. Dinajpur’s only previous triumph had come in the 35th NCC. Captain of Dinajpur Arif Reza was declared man of the final for his all-round performance. The opening bowler claimed one for 24 before top-scoring with 46 off 54 balls in the chase. Asaduzzaman Prince of Mymensingh was adjudged man of the tournament for scoring 154 runs and bagging nine wickets in the tournament. Kanij Fatema Mustaq, MP was the chief guest at the final and distributed prizes.